We had wind that something was coming from the minds of Dave Weagle, Hap Seliga, and Jason Schiers. Respectively, these guys are: arguably one of the brains behind modern mountain bike suspension and inarguably the DW-link; co-founder of Competitive Cyclist; and co-founder of EDGE (ENVE) Composites. 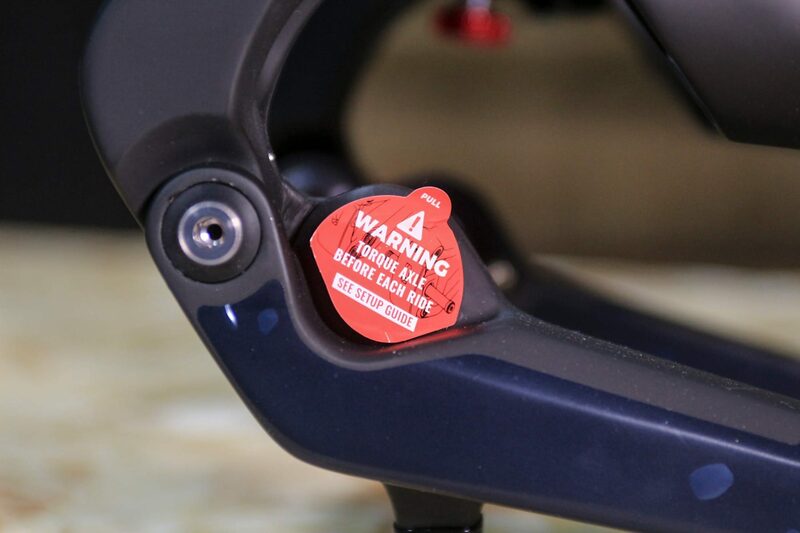 So we knew that whatever the something was it was likely to be bouncy, likely to involve carbon, and unlikely to be a bold new colours/extra stickers type affair. $2,700 of pocket money gets you this. Eventually the lid was lifted, but only to a very select few, and in the far off dusty lands of Utah, where Trust Performance, the trio’s new venture, is based. We were lucky enough to be offered a first ride review from occasional contributor Berne Broudy, and you can read her first impressions here. As with any press launch, it can be hard to get a handle on how the new product performs. 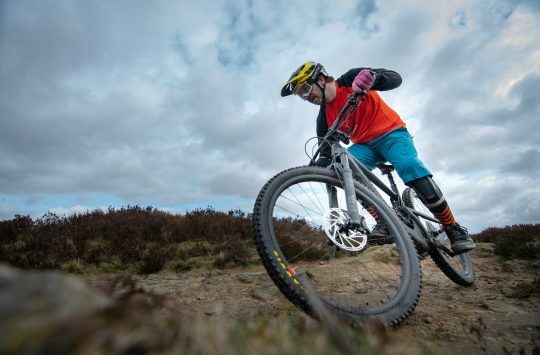 New and unfamiliar trails, new bikes and new kit – are you having a great day, or is the product great? Berne’s ride time was also quite limited, and there were no photo taking opportunities, so we were keen to get our own fork to test and examine for ourselves. Roll on three whole months, and we’ve finally managed to get one of these rare beasts in through the doors of Singletrack Towers. Let’s check it out. No kashima coated stanchion option here. The Trust Message fork comes in a box which is roughly twice the size of a standard fork box. Costing $2,700, you may be glad to feel like you’re getting a bit more for your money. 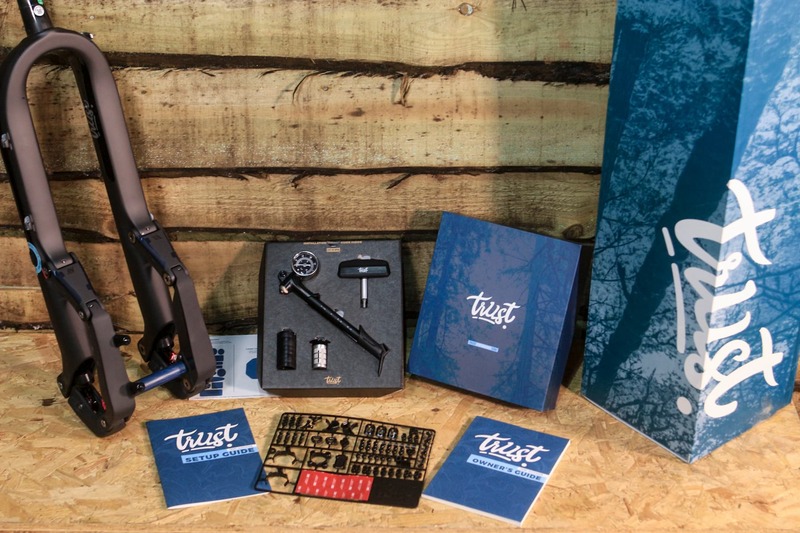 It’s more of a presentation case than a box, and inside you get the fork, a headset, torque key, shock pump, two sets of instructions (one on setup, one an owner’s guide), plus a whole bunch of cable guides and clips, spare pins, and frame protection stickers. Oh, and some stickers for your car/garage/sticker wall. Out of the packaging, it’s immediately obvious that this is no standard telescopic fork. Instead, it’s a four bar linkage fork with twin thru shaft dampers. 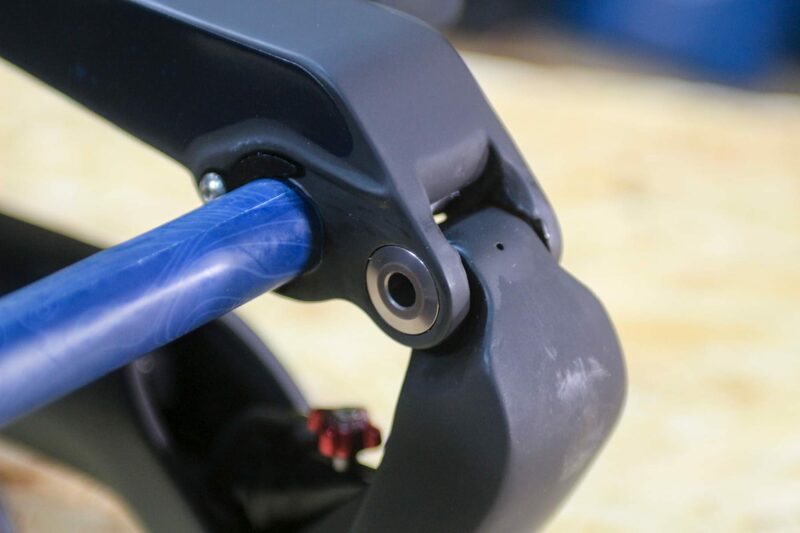 Made of carbon (of course, with the ENVE connection), there are no stanchions, but pivots instead, which move on bearings designed by Trust. 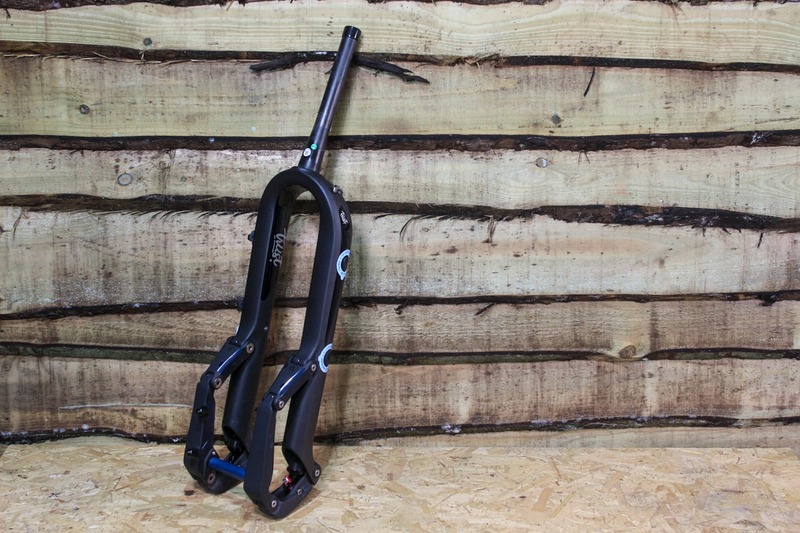 Due to its construction and motion, the fork will apparently fit a whole range of bikes, and provides 130mm of contour travel. Shorter strokes for added stiffness. Perhaps the simplest way to make some sense of what is going on (because there are a LOT of words on the Trust Performance website about the purported benefits of this fork) is to think of it as (and these words are in amongst all those other words) bringing the benefits of rear suspension to the front of your bike. Rear suspension operates using shorter strokes, compact dampers, and pivoting linkages – giving much less stiction than you get up front with a telescopic fork. 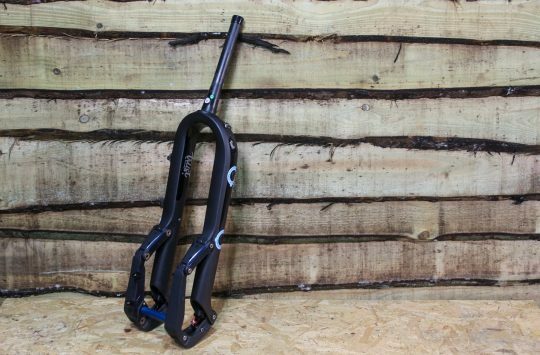 Reducing stiction in a telescopic fork comes at the expense of fore and aft stiffness, and if you’ve ever ridden a noodley fork down a gnarly trail, you’ll know that stiffness is really quite desirable. 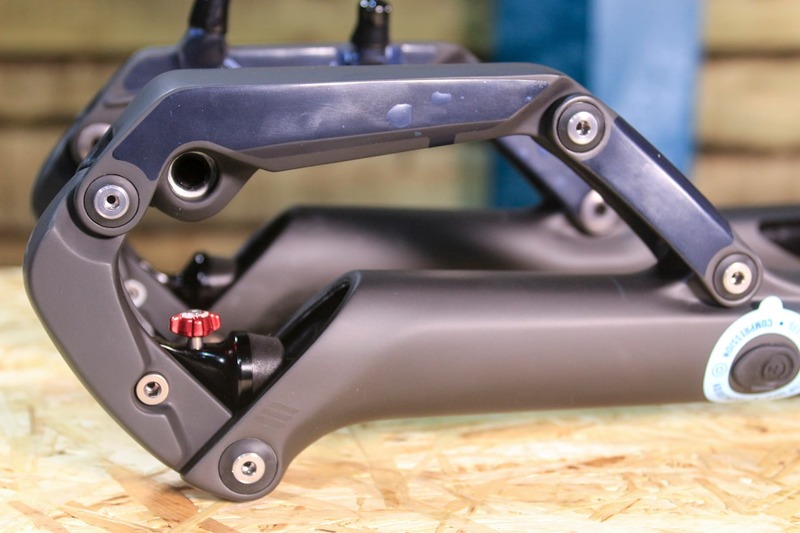 This linkage design seeks to replicate some of the mechanics of rear suspension in a fork. And that’s where your contour travel comes in – as with rear suspension the movement is in two directions at once, instead of a straight line. And that, apparently, gives a very different feel to the fork, as the steering remains predictable through the travel of the fork. We don’t know about that yet, we’ll be reporting back once we’ve taken it round the familiar territory of our local trails. Weigh yourself in pounds, none of that euro-kilo stuff here. Eight pivots. No service interval is mentioned in the manual. 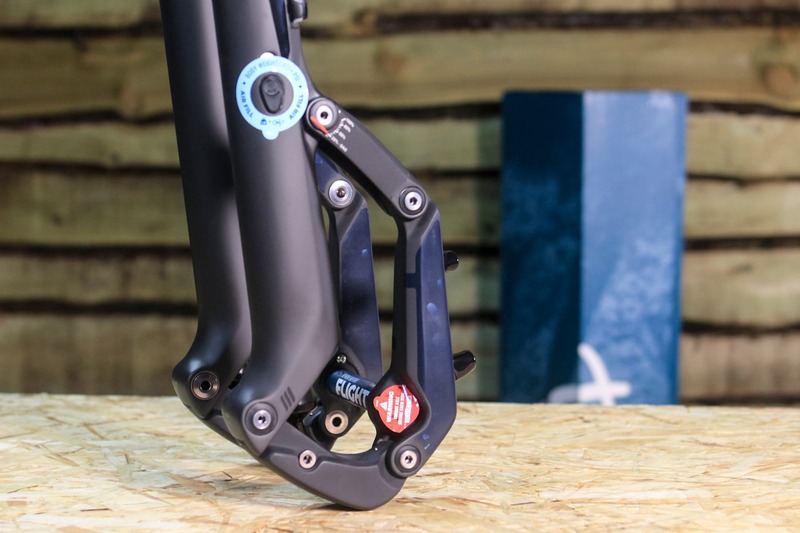 Performance aside then, let’s have a closer look at how the fork delivers that movement. In short: pivots and linkages. Quite a few pivots in fact. For us Brits with a keen interest in mud, this seems an interesting proposition, and it’s certainly something we’ll be paying close attention to during our test. 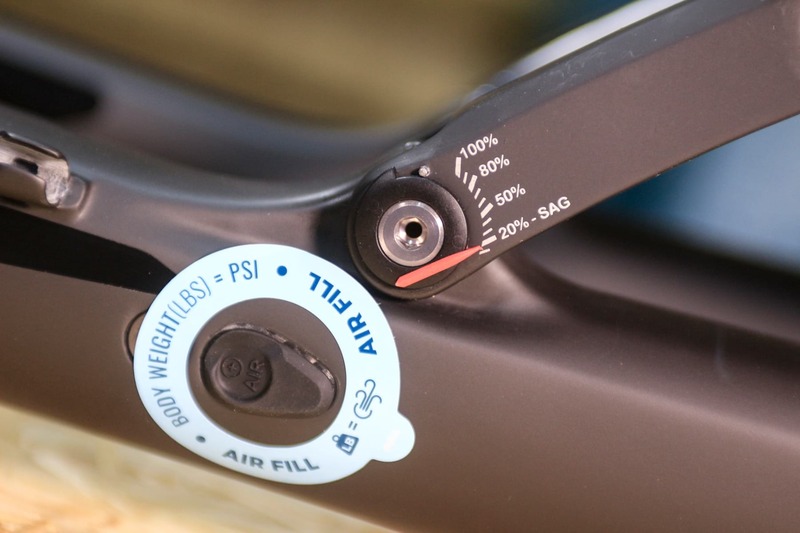 The action of the pivots is controlled by two separate air springs. These need to be pressured to the same psi as you weigh in pounds. This will apparently deliver 20% sag, which can be checked using the sag indicator. 100% sag – the state of our stomachs after a pie and chips. The manual does say to check and re-torque the pivots regularly, as well as torquing the wheel axle before every ride. A torque key is helpfully provided in the box. Note the different ports on the right leg. 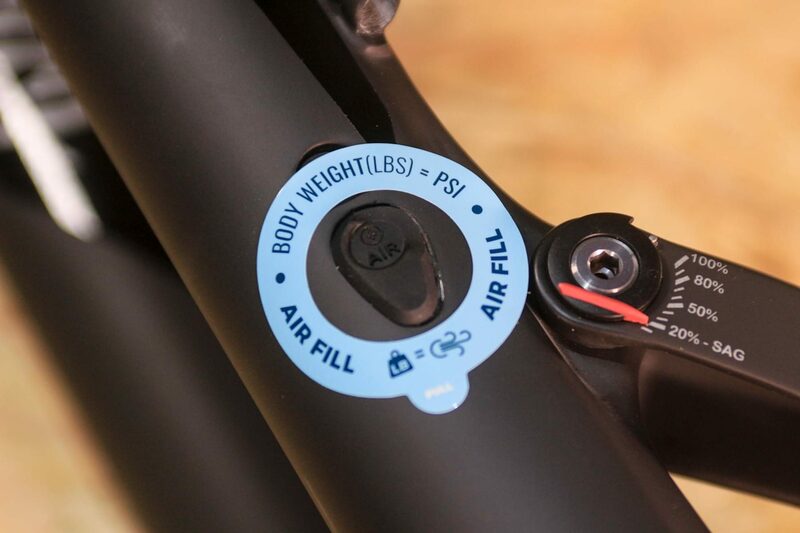 Once you’ve filled up with air, you can tweak the feel of the suspension. 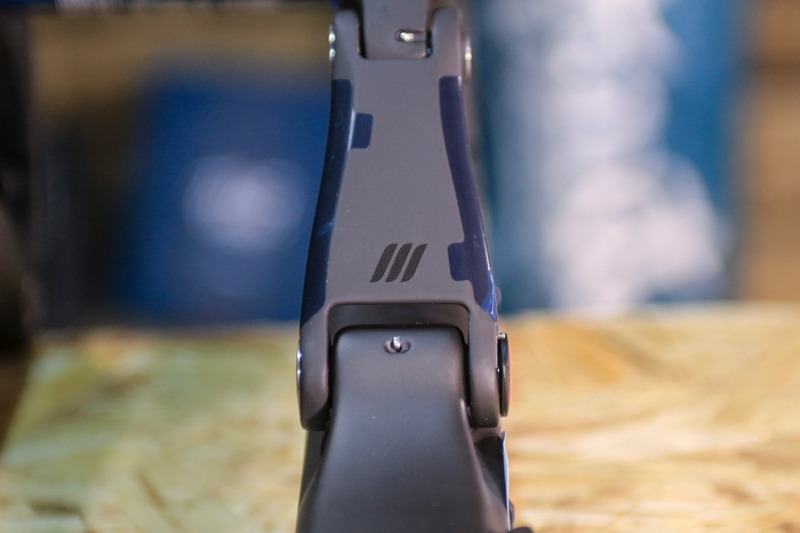 It’s worth noting that on the left leg, the port by the pivot is for the air spring, while on the right leg, further up, the port by the upper control link pivot contains two compression adjusters; one for the Open mode and the other for the Medium (trail) mode on the three-way, on-the-fly adjuster at the top of the fork leg. 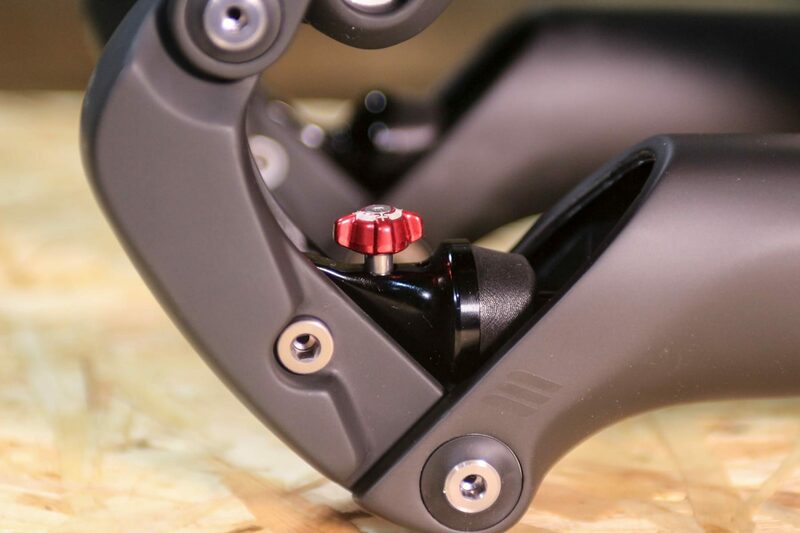 Open offers 20 clicks of fine tuning of the suspension’s reaction to small bumps, slow compressions, G-outs and weight shifts. 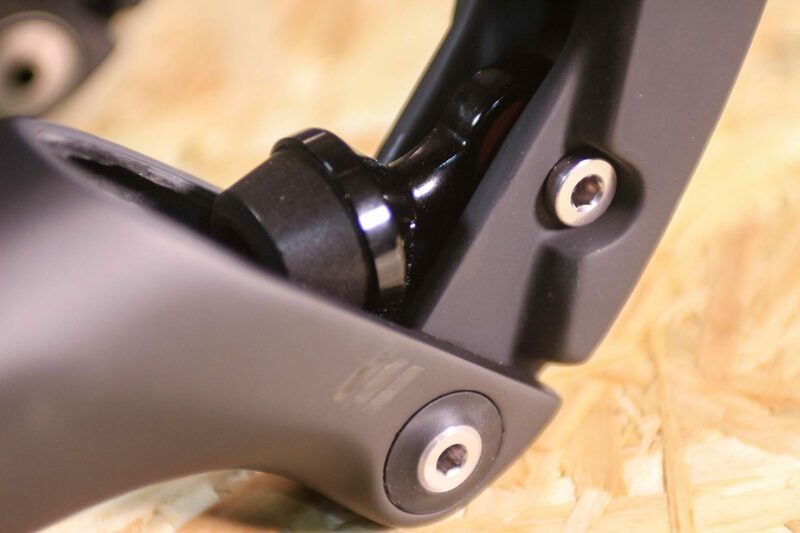 Medium mode provides an increased amount of low speed compression for a firmer feel on smoother surfaces, and only five clicks of adjustment. 20 clicks of rebound adjustment here. There is a further rebound control here, just twiddle the red knob. As mentioned, there’s a three-way adjuster to choose between Open, Medium and Firm damper modes. Firm is a near-lockout, while Open is for rough terrain. If you want to go even further on the adjustment front, you can add ‘Huck Pucks’ to the air can – or rather, you can have an authorised service centre do it for you. 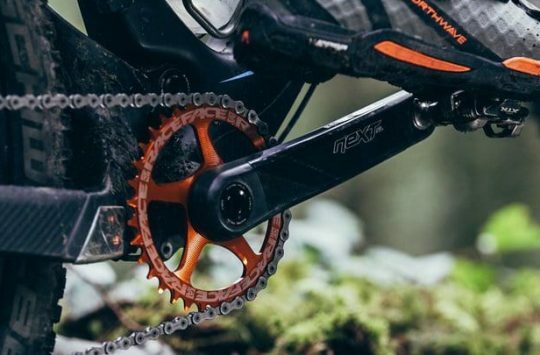 Two of these token-like things come fitted as standard, but you could have as many as six if you ride really hard, or are very heavy. Or indeed have them all taken out if you are a feather weight mild gravel rider. No rubber protection on the underside. 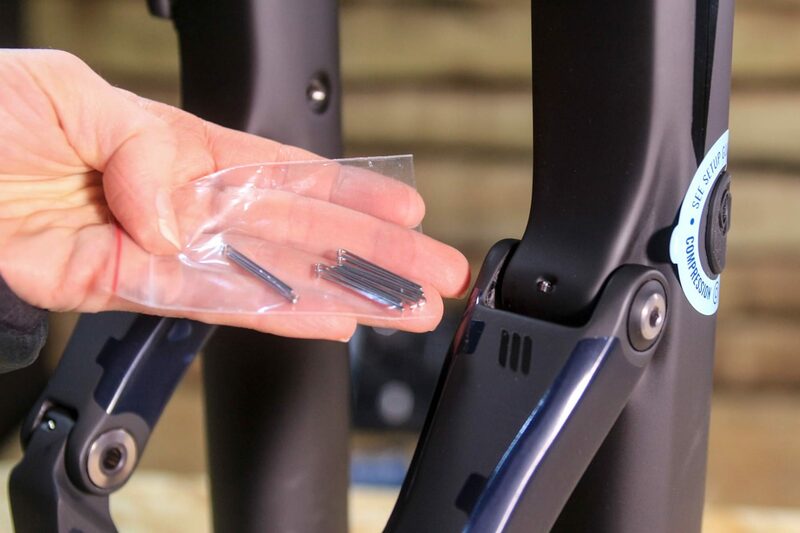 Pivot pins, and spares, are provided to help hold the pivots in place. 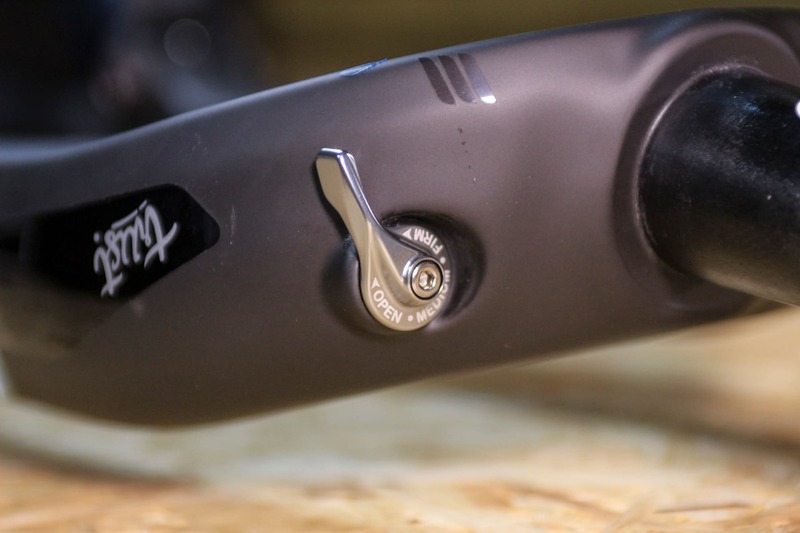 The manual does not make it clear why or when you’d want to remove your pivots, but we’re guessing that if they start to make a grinding noise it might be time to investigate. The air cans are recommended to have a service every 50 hours, while a complete damper and spring rebuild is recommended after 250 hours or 18 months. Pivots though…it doesn’t say. We’ll take it out in Calderdale’s finest filth – if the pivots survive that, then we reckon they’ll survive just about anywhere. I think you need a new channel, perhaps called Singletrack.Top Gear, where you feature stuff that is interesting but that no ordinary mortal can afford. £1300 for a rear shock and $2700 for forks, is more than I spent on my last two mountain bikes. please stick it on a full sus bike. I’d be curious to know how well it works in the real world. I mean it’s dam ugly so it’d better be good. Weird that you need to pressurise each side individually, to the same PSI. 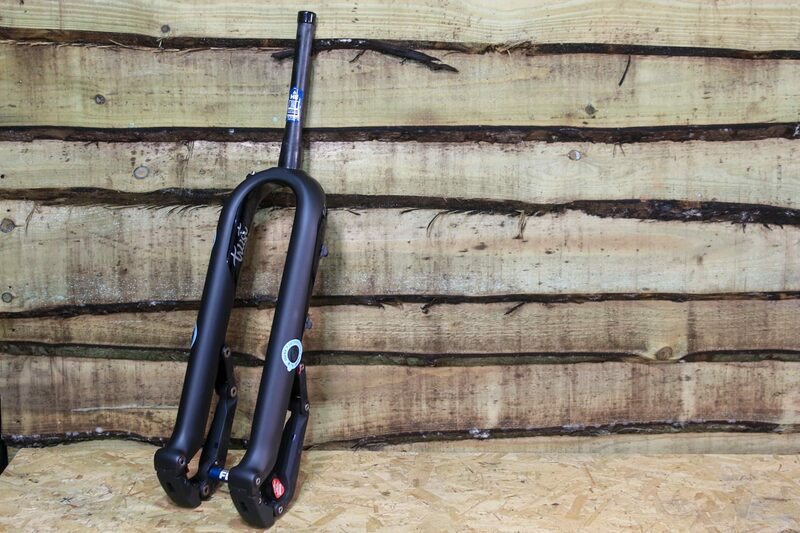 I’d have thought, when designing a fork (that expensive) from the ground up, that a link hose could run from one side to the other, via a hollow crown. Meaning you just pump up one side. Can’t. Stop. Seeing. The. Air. Bubbles. Under. The. Stickers. Damnit!!!! Suddenly the Lefty doesn’t look that bad, does it? @andybrad – It’s been on a hardtail for the first ride, but went on the full suss this morning. Kitchen bounce test results: … interesting. Descend like a comet through some vomit! Ride like a geezer though pavement pizza!